hiiiii friends. i recently posted an instagram story of this makgeolli sponge cake and i’m pretty sure that my friends who reached out expressed just as much excitement as i did when my mom made it for the first time. 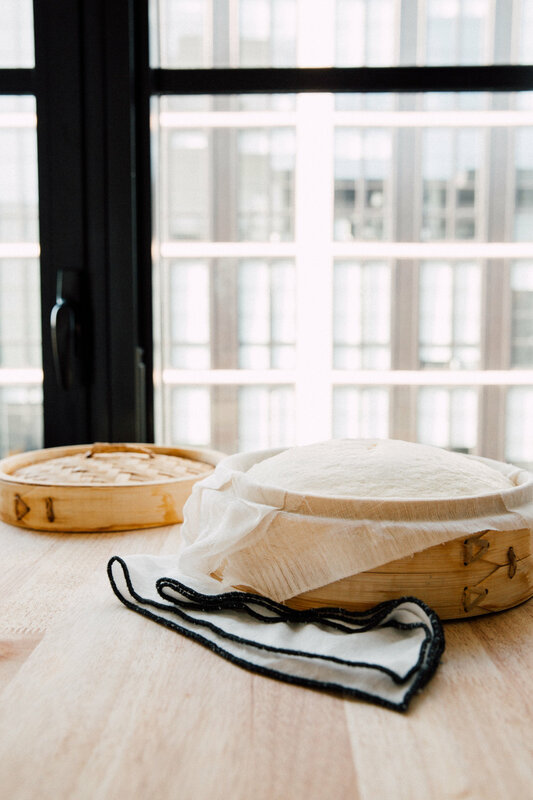 close your eyes (after you read this sentence) and imagine a warm sweet sponge cake buoyantly bouncing around in your mouth….that tastes like makgeolli! if you don’t know what makgeolli is, please get out more. just kidding, that’s kind of mean but really, get out there and try it! makgeolli is a korean unfiltered rice wine that has this carbonated, creamy, sweet, floral, fermented funky flavor all in one refreshing alcoholic beverage. it’s usually served at korean restuarants, and i’d classify it as a level 2 korean culture drink. level 1 is your basic hite or soju. level 2 for sure is makgeolli. your waiter will probably be decently impressed with you if you’re not korean and ordered a bottle #socultured. level 3 might be that plum wine but i’m not sure who actually orders that except older folk. anyways, all of this to encourage you to please go out there and try some good ol’ makgeolli. more about the cake. if i were ever tasked to feed thousands of people cake, i’d hands down pick this cake because it’s sooooo tasty, easy to make, and pretty economical; one batter will yield you a heaping mound of goodness. if you’re living solo like me, you’ll probably find yourself feeding this cake to your coworkers and friends since it has to be consumed fresh and within 24 hours of steaming. leaving this cake out for any longer will result in you having to consume a dry mediocre cake that you’re most likely going to toss. i was craving makgeolli cake last night and made some, but didn’t completely think through what i would do with leftovers until my uber to the airport was just shy of 3 minutes of arriving. i couldn’t bring myself to throw it away and knew it would dry out on my flight. so…i made a panicked decision and quickly packed it in a lululemon shopping bag and dropped it in front of my asian neighbor’s door because sharing is caring aaand he and his asian family would have a higher chance of enjoying asian sponge cake over the non-asian doormen downstairs. right? fold dry ingredient mixture into wet mixture, whisk until evenly mixed and smooth (aka flour clumps are gone). pour batter into steamer lined with a cheese cloth, cover with lid. steam at a medium high heat for 15 minutes. whatever you do, do not remove the lid – removing the lid could result in a deflated rubber cake :( trust the process! turn heat off, cool for 5 minutes. using oven mits, carefully remove steamer from pot and set on a heat safe surface. 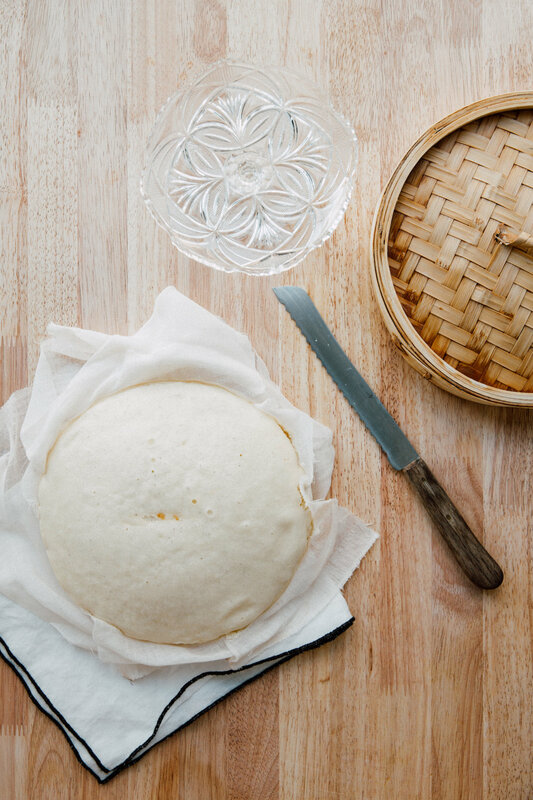 remove lid, lift the sides of the cheese cloth, and transfer cake onto a plate. slowly peel cheese cloth back from the sides of cake (it’s okay if you lose some cake here). cut into slices and serve warm!